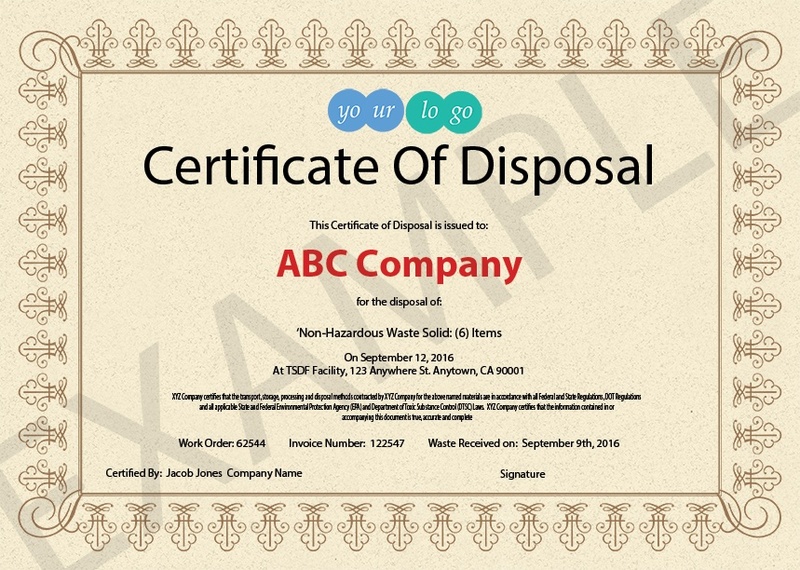 Are you confident that your hazardous waste transportation company is adequately disposing of your hazardous waste streams? This means that you, as a waste generator, have complete responsibility to maintain compliance with RCRA regulations for the hazardous waste you generate - from its initial generation, through transportation to its final disposal. One of the most important components of hazardous waste removal is the certificate of destruction. This certificate is just one of the records required when shipping hazardous waste. According to the Department of Toxic Substances (DTSC), a uniform hazardous waste manifest also must accompany most hazardous waste that is shipped off site. Why are documents like these so important for your company? The certificate of destruction, for example, provides generators with a method of tracking their loads of hazardous waste. This ensures confidence that the waste has been disposed of properly and offers knowledge of where that disposal has occurred. What Should Be Included On A Certificate of Destruction? The name of the waste generator goes in this spot. When examining your certificate, make sure the name of your company is displayed as its legal name. This is the first component of establishing a transfer of custody that shows how you turned over materials for destruction. This portion of the certificate includes the name and address of the facility that will accept the waste, store the waste and then destroy the waste. The work order number is generated when a generator initiates the services of the hazardous waste transportation company. This unique transaction number will allow you to locate your work order and establishes an audit trail if needed. After the order is accepted and the services are under way, the invoice number can be added to the certificate of destruction. This also establishes an audit trail and is a unique, serialized number. This date notes when the transporter received the items. The accuracy of this section is important because it details exactly what type of hazardous waste is being transported for destruction. The document must be signed and certified by an authorized transport company representative. The certificate also should include the date it was issued to you by the hazardous waste transporter. Ensuring that all federal and state regulations are met should be the highest priority when managing your hazardous waste streams. Even if you need additional security precautions for certified product disposal, including a certificate of destruction should be the bare minimum you insist on from the transporter. Here’s why … While certificates of destruction are not required by regulation, they provide generators with a method of tracking their loads of hazardous waste. This provides the confidence that they have been disposed of properly, and a knowledge of where the waste has been disposed. It’s easy to think that the manifest handles any important details. And, while it’s true that information about the load should be indicated on the manifest, there are times when unscrupulous transporters will say one thing to the generator, and actually dispose of the waste somewhere else. This, in turn, could cause the generator severe legal problems. That’s why requiring a certificate of destruction complete with the 10 items listed above is essential for ensuring you have fulfilled all of your legal obligations in the transfer of hazardous waste to a transporter. Working with an experienced and properly licensed and insured hazardous waste transporter that offers a certificate of destruction will provide you with the comfort and assurance that the job is being done properly.